In our last blog post we shared a couple of our favorite enrichment ideas you and your puppy can enjoy daily. Now we are going to shift our focus to one of the most important aspects of puppy development—socialization. Socialization, as defined by the AVMA, is “preparing a dog or cat to enjoy interactions and be comfortable with other animals, people, places and activities.” Genetics certainly play a role in your puppy’s development, but puppies begin learning from the moment they are born and throughout their lives. With that said, you will have the most influence over your puppy’s socialization between 8-16 weeks of age. That’s because during this period they easily make strong associations with the world around them. These connections can be positive (what is safe, fun, or comfortable) or negative (what is scary, not fun, or uncomfortable). At Central Bark, we aim to help all puppies feel comfortable and confident when meeting new dogs and learning new things. We do this by providing a safe and fun environment for puppies to socialize in and by providing knowledgeable information that dog parents can use to support their puppies at home and in the world. Our short list of puppy socialization Dos and Don’ts can help you make thoughtful and healthy choices on your puppy’s socialization journey. Do take your puppy to new places. Prepare your puppy for all the things they’re likely to see as adult dogs, but at a fraction of the duration and intensity.For instance, if you’d like your puppy to be comfortable at a busy family picnic, begin by acclimating them to the park when there are no other people or dogs around. Let them sniff, play and eat treats in this space without the pressure of social interaction. Then, slowly build up to the real-life experience. During this process, make sure to listen to your puppy’s body language*. If at any point they seem nervous, make sure to slow down and retreat to a safe place where they feel comfortable. Be prepared to move more slowly in the future.Other life experiences they will need to prepare for are likely to include veterinary care, grooming, and boarding. Puppy classes are a great resource to get you started and provide a safe environment to practice these things. *Below you will find a graphic that lists signs of stress in dogs. We highly recommend printing it out so you can familiarize yourself with these important physical signs of stress. Not listed are more obvious signs, like whining and trembling. Don’t jump in the deep end. Pushing through a challenging moment will not benefit your puppy. Remember to start slow. Your puppy will be much better off if you ease into new experiences rather than launching into them head first. It’s easier to build good experiences at a gentle pace than it is to recover from experiences that go poorly.If your puppy is already nervous of a particular experience, we’d recommend reaching out to an ethical trainer in your area that practices positive reinforcement techniques. Compassion is one of Central Bark’s core values. Our goal is to help puppies make positive associations and feel confident. Correction-based training methods can create negative associations and will often make nervous dogs feel more scared. Do set them up to experience playing with safe, social adult dogs and puppies of a similar age. Puppies love to play! Playing with other socially appropriate dogs can help your puppy learn how to play safely and gently. Doggy Day Care can be an excellent place to practice these skills. Every dog who attends Central Bark’s Day Care program goes through a Behavior Assessment to ensure that our environment is a good fit for them. We also require a regular weekly schedule to help all the dogs in our care feel comfortable and confident. This routine and familiarity set dogs up to be socially successful long-term. This is all part of Central Bark’s safety program.Puppy classes are another wonderful way to set your puppy up for success and give them new, safe experiences. The social needs of a puppy should be met multiple times a week, so having a few ways to accomplish that should be a priority. Don’t skimp on the treats! It’s a common misconception that you can reinforce a dog’s fear of something by giving them attention or treats when they’re frightened. This is simply not true.To put this into perspective, imagine you’re frightened by clowns; now imagine every time you saw a clown the person you love and trust the most in the world completely ignores you, or worse, scolds you for being frightened. Being ignored or scolded by someone you trust in a moment of fear will only heighten your fear.Now imagine the opposite, you see a clown and your trusted friend tells you that you’ll be okay, and even better, offers you your favorite food. This small bit of comfort, over time, can go a long way to helping you cope with your fears and can even teach you to be less afraid.When your puppy shows you that they are frightened, take note of the environment so you can be prepared with tasty treats in the future to help them feel more comfortable. If they can eat treats, feed them! If they can’t eat treats, it’s likely a sign that they are too scared, and you should move them away from whatever is frightening them. Keep in mind, that while it’s important to help your puppy experience many good things in a short period of time, socialization is about quality of experiences, not sheer quantity. Once you’ve started, continue creating positive experiences as your puppy won’t reach full maturity until they are between 2-4 years old. During adolescence, puppies go through several “fear periods” in which they may appear frightened by things they have previously been comfortable with or ignored. And while this is all part of normal development, how we support our puppies during these critical stages can have lifelong impacts. You can refer to these Dos and Don’ts throughout your dog’s life because they will remain a good foundation for how to support your dog in the world. Have fun on your socialization journey with your puppy and see you next time at Central Bark! In case you missed it, check out Part 1 of this blog post, Puppy Enrichment Tips and More. See you next time, at Central Bark! Carla is an Operations Field Representative for Central Bark and co-owns a dog training and behavior consulting business, Good Karma Canine. 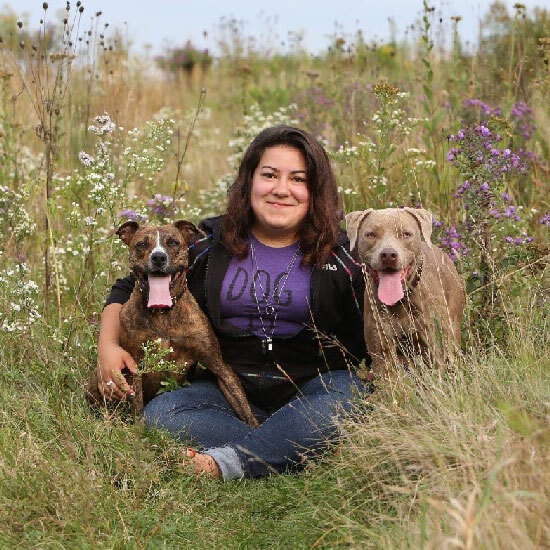 Carla has three dogs Karma, a seven-year-old American Staffordshire Terrier Mix; Gypsy, a five-year-old Bull Terrier/Lab Mix; and Newt, a two-year-old Chihuahua.